After Chiara and her husband devoted one of their monthly date nights to a stained glass course, she soon found herself with an expensive but wonderful new hobby. Within a couple of years, she left her executive recruiter position to be a full time artist. Chiara finds stained glass to be the perfect medium to express her passions for gardening, scuba diving and the ocean-related. 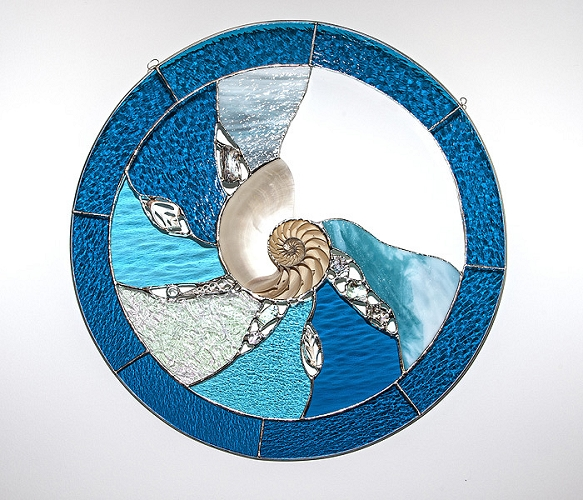 She loves to feature the nautilus shell in her stained glass designs because it reminds her of the Fibonacci sequence, one of nature’s miraculous patterns favored by artists and architects for centuries. All her stained glass pieces are made with eco-friendly lead-free solder. Chiara is enjoying her new career immensely and says her success as an artist is beyond her wildest dreams!